New to One Monthly Goal? Welcome! To join in for January, publish a blog post, an Instagram post or a post on Flickr where you share a picture of your project, some words about your goal and include a link back to this post. Then come back at the end of the month and share your results. You can read about the event and the rules on the main event page. Sign up to receive email notifications when the One Monthly Goal linkup is open. Think of it as a helpful reminder! Did you read all about the sponsor announcement for this year? We've got an amazing line-up of designers and really great sponsors. We have three great sponsors for January and there will be three (3) winners this month plus a chance to earn an entry for the bonus prize! New this year is a chance to earn a bonus prize for the quarter - each time you link up a goal & a finish in January, February and March earns you an entry for a bonus prize which will be awarded in early April. 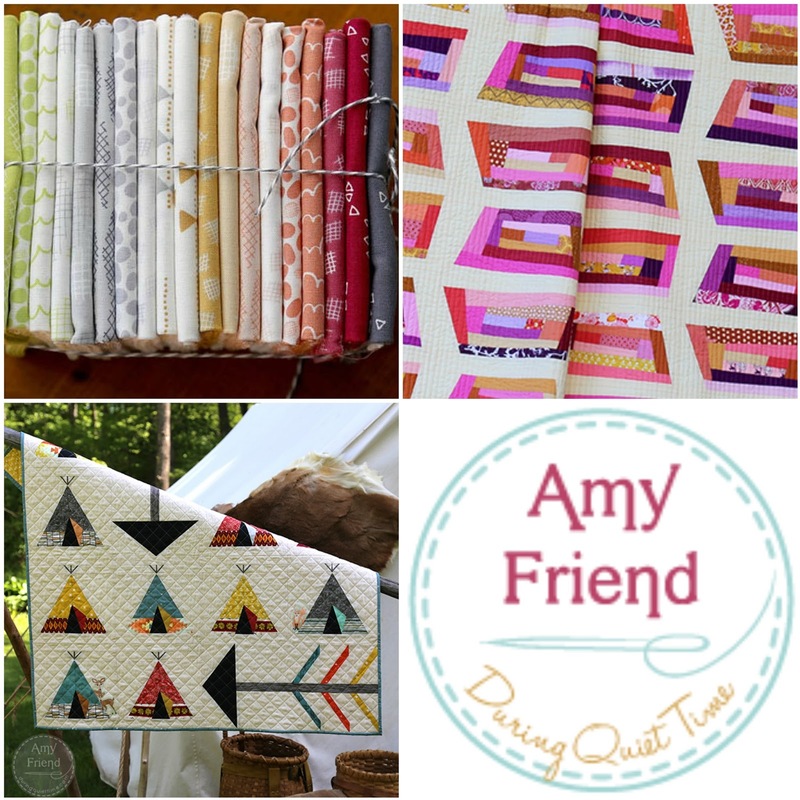 Amy Friend of During Quiet Time,is our featured designer for January. Amy is a pattern designer, author and fabric designer. She mixes two of my favorite things together - improv and paper piecing - in her wonderful quilt designs. 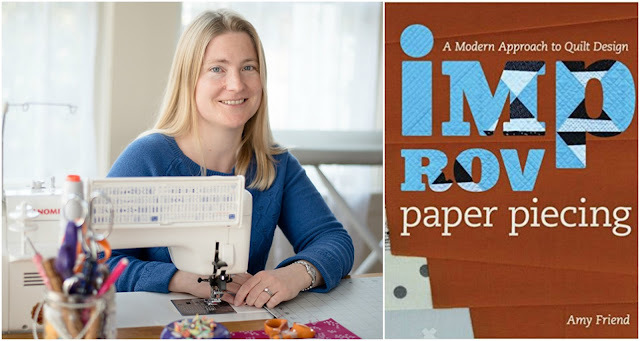 I just love Amy's designs and really enjoyed each of her books Improv Paper Piecing and Intentional Piecing. Amy's fabric line is Improv for Contempo Studios (part of Benertex) was introduced in Spring 2017. 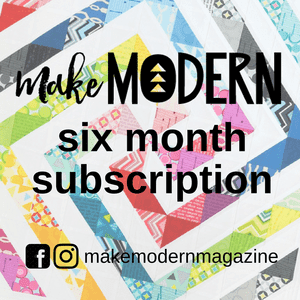 It features beautiful prints with small scale designs perfect for paper piecing. Bundles of the fabric and coordinating Aurifil thread pack are available in Amy's store. Photo and quilt credit to Amy Friend. You can visit Amy on her Blog, on Instagram, on Facebook and find her patterns and fabric in her Etsy store. Amy is offering one lucky winner three (3) PDFs patterns of their choice. My goal for January is to finish my Magnolia Mystery quilt. I've got the center bit together and need to figure out the final size and do some quilting. 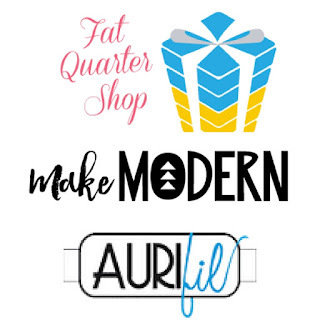 Elm Street Quilts One Monthly Goal January Linkup. I'm looking forward to see it finished! Good luck! Oh very pretty!! Go you!! You can do it! Good luck! 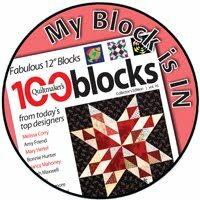 That's a pretty block...reminds me of a tulip block I made for a quilt long ago. Thanks for the linky and encouragement! I wish you well on finishing your lovely quilt. Your Magnolia mystery is very pretty--I always like when a secondary design magically forms! Good luck with the finish. Beautiful quilt. Can't wait to see it done. Love your Magnolia. Good luck on moving it forward. And thanks for sponsoring OMG!! Your Magnolia Mystery colors are so striking! THat's going to be really neat. We have the same goal....but I am two months' behind. Thanks to you, I have already start my OMG January! It works ;))!! Thanks for the link--up! I hope we both can meet our goals--lol! Looks like another year of great motivation. Hope my batting average is better than last year! Wow! What a wonderful start to the new year with so many link-ups! Happy quilting to all, may it be a great year! Thank you Patty for hosting! Your Magnolia Mystery center turned out beautifully! Thanks for hosting OMG for another year! 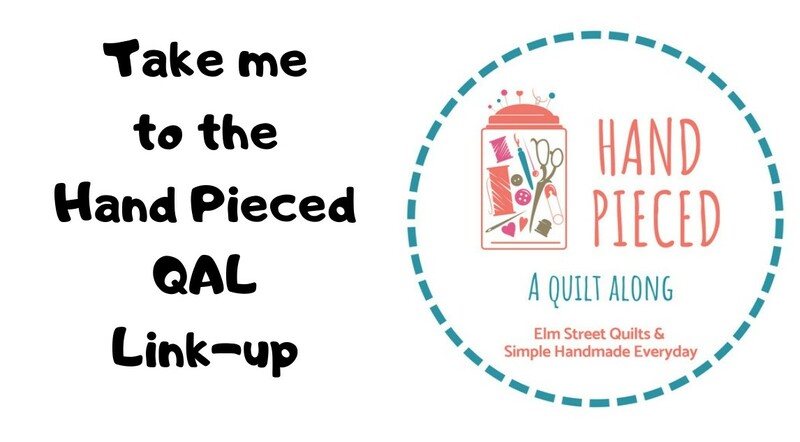 Looking forward to finishing more projects this year with the help of Elm Street's OMG link-up, also looking forward to seeing the Magnolia Mystery quilt and many other projects posted here at the end of the month.